Adam Lee had a long freelance career as a writer and artist in the greeting card industry before coming to Magic's creative team. He grew up in the commune-laden wilds of Northern California in the 70s and his Guild Quiz result was Selesnya. "Be groovy, people." Ravnica is a plane covered by a vast metropolis. Within the great city, ten guilds vie for power, each carving out its territory within the maze of buildings and alleyways hoping to gain the upper hand in an intricate planar chess match. Over ten thousand years ago, a war tore across the plane of Ravnica. Ten armies battled for control of the plane, a conflict born of Order vs Chaos. 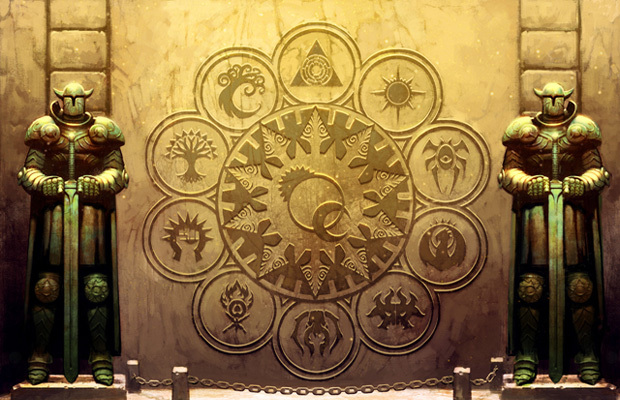 It only ended with the creation of a magical contract of immense power known as the Guildpact was signed by the leaders of each of the ten guilds—ancient beings known as paruns—all of whom became the guildmasters of Ravnica. The Guildpact was created to ensure that the guilds would play specific roles within the infrastructure of Ravnica, allowing the city to grow and expand. Over the millennia, each guild gained mastery over the two colors of mana which shaped and molded it. This unique mana pair allowed the guilds to seek their own identities and destinies while remaining within the confines of the magically binding Guildpact. For 10,000 years, the city grew and flourished under this structure as the guilds evolved into unique and powerful forces. But then, upon the Decamillennial Celebration, the Guildpact was broken, the ancient balance was shattered, and Ravnica was thrown into chaos. How was the Guildpact broken? What happened to the guilds? For those of you who might not have read the trilogy of books describing these events, here's a brief look into Ravnica's history. In the not too distant past Agrus Kos, a hardened Boros wojek, uncovered a plot by the long forgotten Dimir guildmaster, Szadek. He plotted to destroy the Guildpact and rule Ravnica. Agrus slowly pulled the curtain back with his dogged investigation, unwittingly playing into Szadek's master plan the whole time. 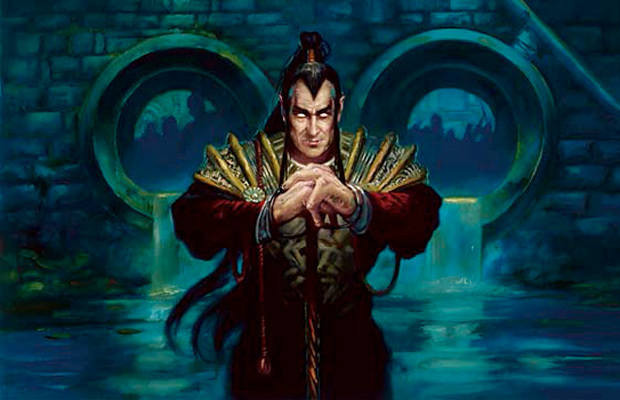 As one of the parun, Szadek understood the brain-numbing minutiae of the Guildpact and he found that a paradox could be created within it that would shatter the magical contract, ruining the forced balance and allowing him to seize control of the plane of Ravnica. Like a master puppeteer Szadek maneuvered Agrus Kos into creating just such a paradox. However, Szadek's plans were all anticipated by the Grand Arbiter of the Azorius, Augustin IV, who knew exactly what would happen if Szadek's schemes were to succeed. To break the Guildpact, the Dimir parun Szadek manipulated a Devkarin elf named Savra into seizing control of the Golgari. She allied herself with the Selesnyans, all as a part to get close to the leader of the Selesnyan guild—the ancient parun known as Mat'selesnya. However, Savra had been fooled, not knowing her death was an integral part of the Szadek's plan. His plan was thwarted by Kos's intervention, but when Kos arrested the ancient vampire, he accomplished what Szadek could not, just as Augustin had planned. The guildpact broke. It wasn't long before the rest of Ravnica's guilds became embroiled in the chaos'. Plots and schemes that were previously restricted were now not just possible, but inevitable. Agrus Kos, with the aid of the Orzhov baron Teysa Karlov and others, worked to stop several of these schemes, encountering everything guildmages, elementals, power-hungry spirit lords, dragons, and city-crushing nephilim. Meanwhile, the Simic guildmaster Momir Vig, along with the zombie-god Svogthir, the Golgari parun, prepared their own plan to conquer Ravnica. Vig's creation, Project Kraj, was unleashed in an epic battle, clashing with the demon guildmaster Rakdos. When the dust settled, Kraj, along with Momir Vig and Svogthir, were destroyed, while Rakdos was hauled back to a lava pit within Rix Maadi in a coma. In the realm of Agyrem—a "blister" on the plane of Ravnica—the spirits of the dead were amassing under the leadership of Szadek. The vampire parun of the Dimir had escaped to Agyrem to recover and gather power, but he was tracked there by the Boros. Razia, who was the Boros guildmaster and parun, aboard the warship Parhelion flew into Agyrem through a rift called The Schism, to do battle with Szadek and his spectral army. 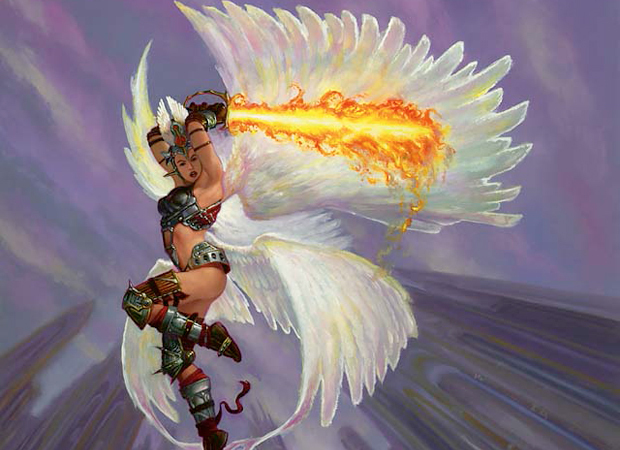 In the ensuing battle Razia was killed, along with countless Boros angels. As the Parhelion returned back through the Schism, without a crew, it headed directly for the Azorius guildhall. During all of this, Agrus Kos met his demise, but due to an Azorius contract his service continued in the spectral realm. Among many spectacular feats, he managed to capture Szadek, holding him in a "grounder" (a device made especially for capturing spirits). Szadek could no longer become corporeal and thus was trapped by Agrus. All the pieces came together after the Parhelion collided with with the Azorius guildhall. In the rubble, the Azorius guildmaster Augustin IV was finally confronted by Kos, Teysa, and their allies. As Augustin spoke, Kos unleashed the captured spirit of Szadek upon him. Augustin perished as Szadek greedily devoured his soul. Then the crashed hulk of the Parhelion exploded, which destroyed Prahv—the Azorius guildhall—beyond all repair. In the aftermath, Agrus Kos became the warden of Agyrem—the Ghost Quarter of Ravnica—and the angel known as Feather took over as Boros's guildmaster after the death of Razia. The Orzhov advokist, Teysa Karlov, drew up a new, non-magical Guildpact, allowing a new fragile stability to be reached. Azorius Guildmaster Grand Arbiter Augustin IV is killed by an explosion while being attacked by Szadek's spirit. The Azorius guildhall is destroyed by the Parhelion crashing into it and then being rigged to explode. The Azorius guild is in shambles. Dimir The vampire parun Szadek is banished into Agyrem, which is then magically laid on top of Ravnica due to the rift known as The Schism being healed. The entire Leaguehall is put under the watch of Agrus Kos. The Dimir guild is thought to have been destroyed and is omitted from the new guild accord drafted by Teysa. Rakdos As Rakdos slumbers in his lava pit, the acting guildmaster, the bloodwitch Lyzolda, procures dragon spinal fluid and blood from Jarad (now the guildmaster of the Golgari), and uses both those and the blood of Jarad's son to cast a spell to awaken the demon. 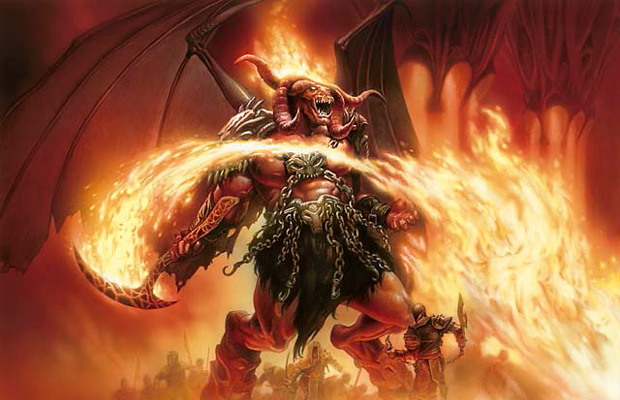 Rakdos awakens and smashes his way out onto the streets of Ravnica and right into a fight with Project Kraj. After the fight with Kraj, Rakdos is hauled back into the lava pit of Rix Maadi in a coma. Lyzolda crumples as soon as Rakdos succumbs to Kraj and is promptly devoured by her Rakdos guild members. Gruul Borborygmos remains in charge of the Gruul clans and is glad to hear the news about the Guildpact being broken. More freedom means more growth. Selesnya Mat'selesnya is almost killed by Szadek but Agrus Kos and friends stop the vampire guildmaster before he can drain her entirely. The Selesnyan Conclave is shaken but not destroyed as its guildmaster heals, reforming with a new group of dryads. Orzhov The Obzedat (Ghost Council) remains at the top of the Orzhov hierarchy but the Orzhov advokist Teysa Karlov openly defies the Ghost Council and breaks her oath of loyalty with it. There exists a shaky and uneasy relationship between the two. Golgari Before Momir Vig could gain control of his masterwork Project Kraj, Agrus Kos kills the Simic guildmaster and Kraj goes berserk. Being magically bound into one body, the Golgari guildmaster Savra is killed along with the Golgari parun Svogthir when Novijen gets destroyed by the raging Project Kraj. Savra's brother Jarad, killed by the Blood Witch Lyzolda, returns as a lich and becomes guildmaster of the Golgari. Simic Momir Vig is killed by Kos before Novijen/Kraj is destroyed. With the destruction of the Simic guildmaster and the guildhall in one giant catastrophe, the Simic as a guild is all but destroyed. 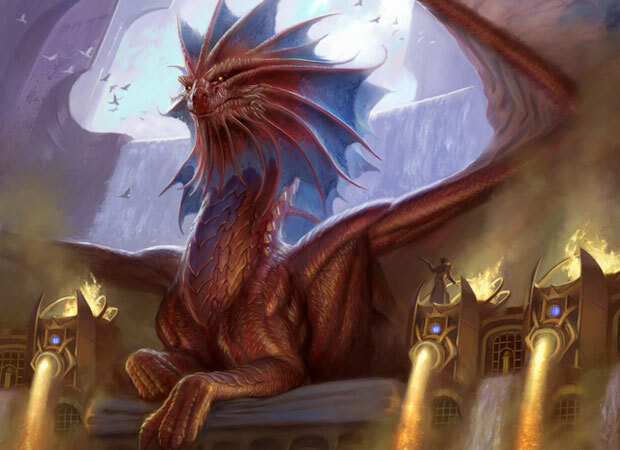 Izzet Niv-Mizzet is wounded in a battle with the nephilim and retreats to an unknown location on Ravnica, presumably to recover. Boros The Boros guildmaster, Razia, is killed by Szadek in a war between the angels and the spirits of Agyrem. The angel known as Feather becomes the next guildmaster of the Boros. Agyrem The "blister" on the plane of Ravnica, known as Agyrem becomes a layer over the entire plane when the rift known as The Schism is healed. It becomes a sort of district of its own under the protection of Agrus Kos and is where Ravnican spirits—including Szadek's—dwell. After the Guildpact was broken, Teysa Karlov drafted a new, non-magical accord between the guilds that was supposed to ensure cooperation and stability for Ravnica. This proved to be rather naïve. It didn't take long for the wealthy power-mongers to begin seizing control of Ravnica. 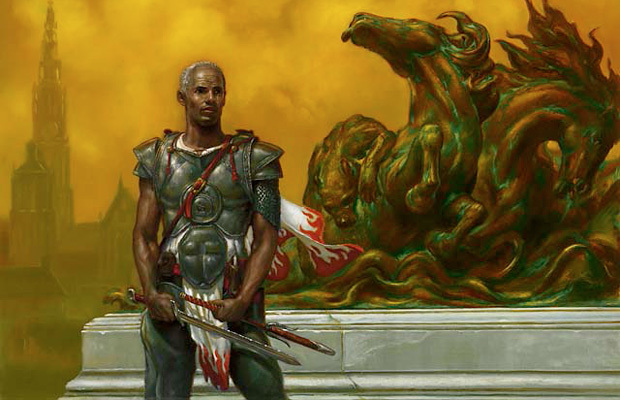 The Boros deteriorated into being little more than bodyguards and security details for the highest bidders, usually Orzhov families—some of whom did their business without the permission of the Obzedat. The Gruul welcomed the burgeoning chaos and preyed on the weak without the magical shackles of the Guildpact, allowing them to rage deep into civilized turf and pillage from the fat of society. Guilds like Selesnya, who relied on converts to populate their ranks, dwindled as Ravnicans at large began to distrust the guilds and the populace rose up against them for their part in keeping them oppressed. The Izzet seemed scattered without their leader. But ten-thousand-year-old habits are hard to break. It took time but the populace's distrust for the guilds faded and slowly they returned. Old guild loyalties that never truly died out began to coalesce and new guildmasters emerged to take the lead, attempting to bring their guilds back to full strength. Rumblings from the hellpit within Rix Maadi sent the Rakdos scampering back to the guildhall to await their demon lord. The merfolk zonots were discovered and a new Simic guild with a new identity, as preservers of Ravnica's natural places, emerged. The Boros began to align under the powerful leadership of the angel Aurelia, who promised that crime would most certainly be punished under the fist of Boros. The Azorius were called on to restore the rule of law and to keep other guilds in check, and Isperia created the lawmages to enforce law through Azorius magic that compels compliance. The Orzhov approached the cynical doubts of the Ravnican citizen with a new tack—the restoration of faith—building ornate cathedrals and gathering places filled with lavish artworks and rituals. 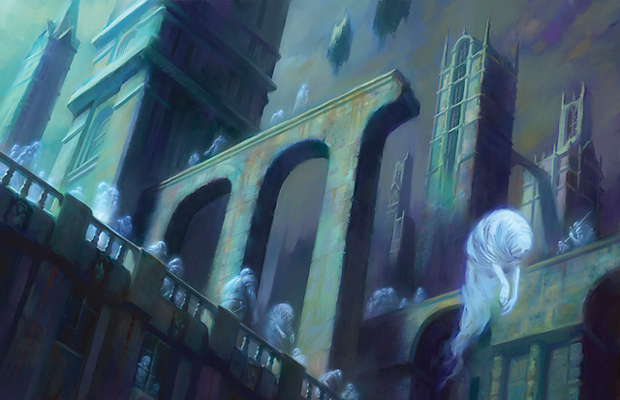 Perhaps taking a cue from the Orzhov, the Selesnya engaged in their own peaceful struggle for legitimacy in the wake of the Guildpact's destruction and chose to create beauty among the stark buildings, with places to illuminate the wonders of nature and inspire contemplation—hopefully on the blessings of Mat'selesnya—for all of Ravnica. With all this going on, the Dimir quietly and methodically coalesced into a full-fledged guild again, fueled financially by 'the continued need for guilds to keep an eye on one another and to know every move made by their rivals. Many of the new details about Return to Ravnica are summarized here. For the full delicious download on the other four guilds in Return to Ravnica, stay tuned for the Planeswalker's Guide to Ravnica parts 2 and 3, where all will be revealed. Azorius The sphinx Isperia is the current guildmaster of the Azorius Senate. Emerging from the wreckage with a new sense of purpose, the Azorius guild builds New Prahv under the leadership of its new guildmaster. Isperia's ideals not only restructure the charters and laws of the guild but also prove to Ravnican citizens a new Azorius commitment to bringing peace and stability to the city. Dimir The shapeshifter Lazav is now the new guildmaster of the House Dimir. From the scattered cells of House Dimir emerges the mysterious new guildmaster, Lazav. His intelligence and ambition have created a new Dimir network. Rumors abound that Lazav is insane, claiming to receive insights from an unseen force. The Dimir again serve as intelligence gatherers, serving the other nine guilds by brokering secrets about their enemies and offering information to the highest bidder. Rakdos The demon Rakdos still rules the Cult of Rakdos. As the demon Rakdos finishes healing within his own personal hellpit at Rix Maadi, he reclaims leadership of the Cult of Rakdos. The Rakdos usher in diversion clubs for the twisted and curious of Ravnica as they devise new ways of expressing their own brand of mayhem. Gruul The Cyclops Borborygmos still rules the Gruul Clans. Freed from the magical shackles of the Guildpact, Borborygmos leads his guild with more ferocity deep into the civilized world, smashing and pillaging where he can while brutally snuffing out any attempts to usurp his dominance over the Gruul. Claims into the Utvara region by the Izzet League cause turf wars between the two guilds, with some new Gruul clan leaders rising to the forefront for their skill in combat—namely a two-headed leader of the Ghor clan, Ruric Thar. 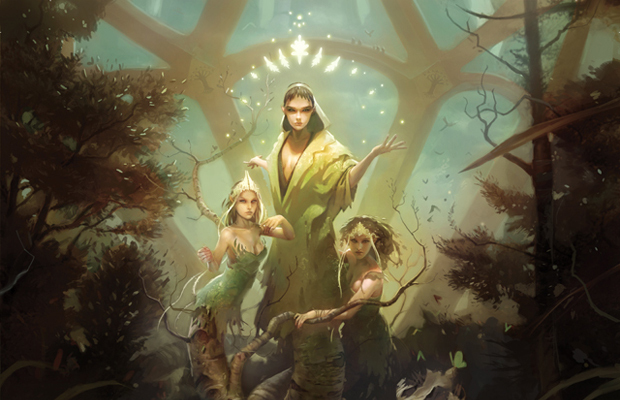 Selesnya The tri-partite dryad Trostani now leads the Selesnya Conclave. After the guilds were disbanded, Mat'selesnya went into a deep hibernation and none seem able to penetrate deep enough into the Worldmind to contact her. The Selesnya guild looked like it was going to fade completely. Trostani is able to restore the link with the Selesnyan parun and developed a deep understanding of her will. Through her, the Selesnyan Conclave is reestablished, a renaissance of Selesnyan culture and architecture issue forth, and the guild is brought back from the brink of dissolution. 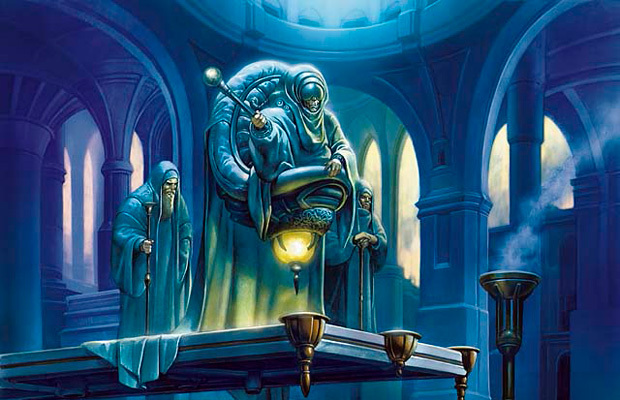 Orzhov The Ghost Council still leads the Orzhov Syndicate, although there are some who say that Teysa Karlov is the real power behind the Obzedat. Not long after its signing, Teysa's covenant proved to be too weak and the guilds fell apart. This resulted in the guilds seeking new opportunities for themselves as best they could. The Orzhov continue doing what they do best, from thuggery and swindling to art patronage and self-serving philanthropy. Only when the Izzet began to reform and seek out large areas for new research facilities did Teysa begin to call for the Orzhov to re-unify, using the powerful symbol of the Obzedat. She does this to legally maintain Orzhov's grip on the ancient land rights set up so long ago and profit from Niv-Mizzet's plans for expansion. Golgari The lich lord Jarad is now the guildmaster of the Golgari Swarm. After the dissolution of the guilds, the Golgari stayed more or less as they were. For 10,000 years, they had been the silent machine that kept the unsavory but essential parts of Ravnica running and knew no other life apart from the dank tunnels of the undercity. Jarad maintains his power, quelling without mercy any rumblings of mutiny or dissent from the Teratogens. He bides his time, knowing that the surface world is suffering without the structure and support of the guilds, and it is only a matter of time before things return to business as usual. Simic Speaker Zegana is now the guildmaster of the Simic Combine. In the aftermath of Kraj, the Simic all but collapsed. For some time, there is no replacement for the guild, but a series of massive sinkholes begin opening in remote areas of Ravnica. Below is an ancient ocean, long-since covered by layer upon layer of city. The merfolk race live there, and they remained hidden butaware of the surface dwellers. Only once revealed do they join the surface dwellers, finding a home in the Simic guild. Izzet The dragon Niv-Mizzet remains the guildmaster of the Izzet League. After fighting with the nephilim, Niv-Mizzet was not seen for a while. 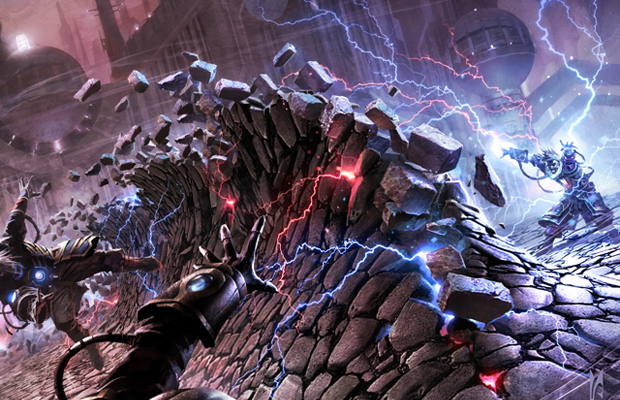 Former guildmages wonder what use this new-found freedom could mean for the Izzet, but without word from their guildmaster, the Izzet League becomes scattered and chaotic. Most Ravnicans saw the disappearance of Niv-Mizzet as the end of the Izzet guild. It isn't until the emergence of large Izzet works being built and strange warehouses humming with manacoils throughout the night do Ravnicans begin to change their presumptions. The ancient dragon parun doesn't have to be visible to control his guild. During his absence, he uses the power of the Firemind to reach out to his guildmages with a complex array of new and mysterious projects for the Izzet League to work on. Boros The angel Aurelia is the current guildmaster of the Boros Legion. Feather was the Boros guildmaster for a time, but was ousted by the war leader Aurelia, who gained leadership of the guild. Aurelia challenges Feather's ascendancy, arguing that a disgraced angel can't command authority or respect. Many agree, and the few who don't are quickly shamed into silence. Now that her hold is secure, Aurelia engenders the same respect and awe as Razia, the original parun. But while Razia was more of a figurehead, aloof and untouchable, Aurelia is an active, forceful leader who is directly involved with her troops. Agyrem The overlay of Agyrem remains on Ravnica until the Mending, which causes it to become distinct and removed from Ravnica—a kind of "metaplane." Little is known about Agyrem now; its whereabouts in the Multiverse are a mystery. Ravnica is vast, and the slice seen in novels and on card is only a part of the entire plane. There are areas where the presence of the guilds is not felt so strongly. You might say that these are the "rural" areas of Ravnica—of course, Ravnica's "rural" is another plane's city. When the guilds were disbanded, some areas of Ravnica didn't feel any change and went about their business as usual. There were some in the unguilded areas who were waiting to capitalize on any moment of weakness and bring the guild structure to the ground. These factions within Ravnica see the guilds as an elite hierarchy who seek only to take control, consolidate wealth, and fragment a populace against itself. Joining a guild and adhering to some ancient guildmaster's creed is not something that splinter movements—such as the so-called Gateless—are willing to accept. So when the guilds reformed, random acts of violence occurred against them. Most of the guilds, even Rakdos, were heavily involved in public affairs, working to win the assent of the populace at large—. Jace Beleren has been busy. As told in the novel Agents of Artifice, Jace brought the Ravnica cell of the Infinite Consortium to its knees, dealing a crippling blow to Tezzeret's mind and body in the process. Jace then vanished into the Blind Eternities. When he returned to Ravnica, Jace was seeking a place to forget the Multiverse for a while. Everything he had come into contact with turned into a knot that seemed to only get more tangled with each attempt to unravel it. From Tezzeret and Liliana to the Eye of Ugin and the Eldrazi, Jace had endured more than he could handle and went back to the only semblance of a home he knew: Ravnica. But even lost within the countless faces and alleys of the great city, Jace still felt unsettled—an alien visitor who had seen far too much of the Multiverse to simply forget. He needed a distraction—something to take his mind off a feeling of walls closing in, of mental spiders climbing up from the depths of his unconscious to remind him of some unknown past or future dread. In Ravnica, he found just such a distraction. He began studying the guilds, the endless maze of streets, and most especially the movements of the dracogenius Niv-Mizzet. 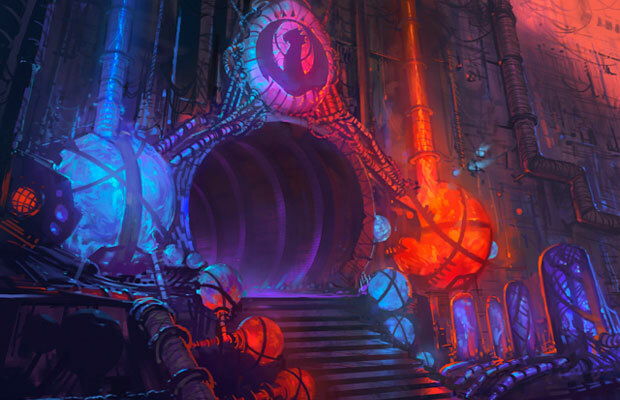 New Izzet labs and workshops openedin a chaotic pattern, but Jace knew there must be some underlying principle to the seemingly random activities of the dragon mastermind's guild. The resurgence of the Dimir was another concern for the mind mage; in them he saw the Infinite Consortium dressed in different clothing. The Dimir had put on a public face but they still hid the same ominously secretive interior. Jace has set up shop in a nondescript section of a nondescript district. He knows both physical eyes and psychic eyes are prying, trying to divine the intent of the mind mage's presence and the nature of his interests. There is something special about this city plane and Jace can't quite put his finger on it. But ancient secrets are unfolding as his inquiry delves deeper into Ravnica's hidden past and uncertain future.